Enjoy a cup of sweet, juicy, delicious raspberries in this fine blend of tea. Superb, luxurious taste that you won’t find in any other Tea. * The leading ingredients in Scripture Raspberry Tea; hibiscus, rose hips, apples, elderberries, and raspberries, according to recent studies, are a great source or lowering high blood pressure, preventing colds, heart disease, cancer, infections, and are a great booster for the immune system. It was also found that drinking tea consistently led to lower cholesterol levels. 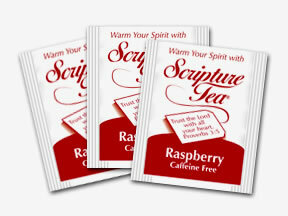 For the past 25 years, Scripture Tea has maintained excellence in its products. We continue the same standard with our Raspberry Tea. Enjoy and be blessed! * The following information should not be considered medical advice and is not intended to replace consultation with your physician. Try our other delicious flavors, all rich in antioxidants: Chai Green, Plum White, Green, Orange Pekoe Black and our Caffeine Free Apricot and Blackberry. In addition to Personal Use, Scripture Tea is ideal for: Church functions, group teas, welcome packets, goodie bags, wedding & shower favors, house gifts, hospital gifts, holiday gifts, gift baskets, and so much more. Call 407-656-1004 to discuss other uses and unique ideas for our tea products. *PER 100 INDIVIDUALLY WRAPPED TEABAGS.